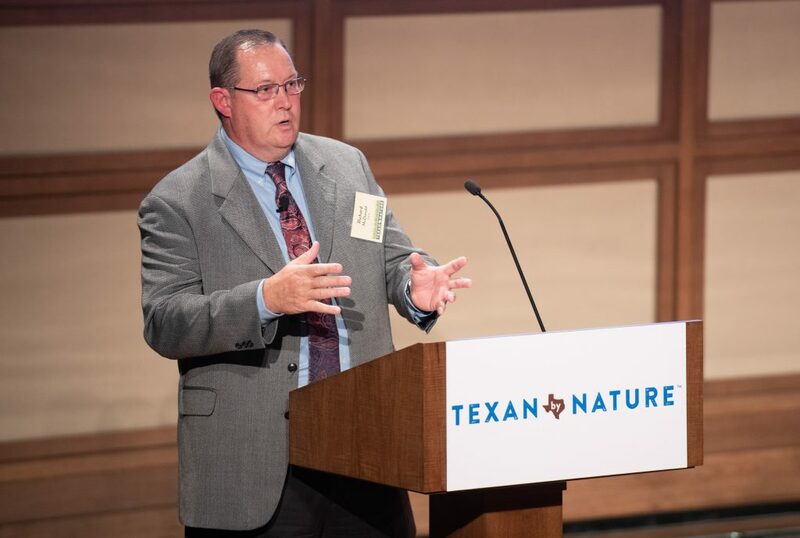 On Ocotober 29, Richard McDonald, Corporate Director of Environmental Affairs at H‑E‑B presented at Texan by Nature’s first annual Conservation Wrangler Summit & Celebration at the George W. Bush Presidential Center in Dallas, Texas. This important event brought together over 200 Texas leaders to engage in a thought-provoking summit exploring the beneficial connection between conservation and business. The event culminated in a gourmet meal and celebration of the 2018 Texan by Nature Conservation Wrangler projects. Conservation is becoming a big part of businesses and their goals. At the Summit, attendees learned how H‑E‑B views their role in the overall chain of people, prosperity, and natural resources. Whether we’re landowners, businesses, or simply Texans, we each play a role in taking care of our state. Richard McDonald shared how H‑E‑B is planning to meet bold goals through customers, partnerships, and the processes and practices they employ to ensure long-term sustainability, profitability, and success. With 425 stores and over 109,000 partners, H‑E‑B is setting the example for businesses to be sustainable. H‑E‑B has set a standard for themselves with core sustainability and conservation tenets: Protect land, air, water and natural resources. Building sustainable stores and facilities with the smallest environmental footprint possible. Holding partners, vendors, and suppliers accountable. Supporting organizations and groups that have a true deep passion for environmental conservation, sustainable practices, and education for our children and young people. Be relentlessly dissatisfied with the present. H-E-B is doing their part to take care of Texas! H-E-B won the Texas Environmental Excellence Aware for Innovative operatiions & Management in 2015! In Texas and Northern Mexico in 2017, food bank donations reach, over 33 million pounds which provided over 25 million meals to families. H-E-B’s Community Investment portfolio includes contributions to support environmental programs for organizations such as: Texan by Nature, Keep Texas Beautiful, The Nature Conservancy, Audubon Texas, EarthShare of Texas, Cibolo Nature Center & Farm, Ocean-Trout Texas, Hill Country Conservancy, National Wildlife Federation, San Antonio BotanicalGardens. and many more. At H-E-B, they are committed to responsible and safe seafood sourcing! They source from legal, traceable fisheries that under science-based management programs. H-E-B also supports fisheries that are committed to improving their environmental performance through programs such as fishery improvement projects (FIP’s). The health and management of individual fisheries are considered in all or our sourcing decisions_. In 2017, H-E-B donated a 24 foot research vessel to The Nature Conservancy of Texas to help support their coastal restoration work and research. Nine H-E-B stores have been awarded LEED® (Leadership i n Energy & Environmental Design) green building certifications since 2009, and H-E-B has incorporated many of the same sustainable design strategies into their new stores. Their LEED Gold Certified H-E-B at Mueller store in Austin serves as a test for numerous sustainable innovations including the first North American supermarket use a whole-store propane refrigeration system. The landscaping at H-E-B stores includes native and adapted plant selections appropriate to the area to reduce watering needs. H-E-B has saved at least 928,000 gallons of water each year by keeping trash wash cycles below 5 minutes per wash.
Low flow restroom and kitchen fixtures have been used for many years in new store designs. Car wash rinse water is reclaimed, filtered, and reused in the wash cycle reducing their potable water reuse by 80%, saving over 10 million gallons of water in San Antonio alone. H-E-B’s boilers at the San Antonio Retail Support Center take advantage of condensate return – 8 million gallons! Due to fuel-saving strategies, H‑E‑B was the only Texas-based company invited to serve as a charter partner in the Environmental Protection Agency’s (EPA) SmartWay SM; Transport Partnership. The partnership was formed to reduce greenhouse gas and other harmful emissions from the heavy-duty sector. H-E-B has improved fuel economy by 14% in the past 5 years by using new technologies and running engines at lower RPM’s at road speed. HEB has reduced their use of diesel fuel by over 830,000 gallons each year and carbon dioxide emissions by more than 8,300 tons annually, which is the same as removing 614,815 cars from the road for one day. H-E-B is recycling their used truck tires into rubber mulch. At H-E-B’s Weslaco distribution center they have installed nearly 4000 solar panels spanning 105,000 square feet. The 1.2 megawatt installation supplies 40% of the center’s energy each year of roughly enough power to serve 2000 homes every year. In addition, H-E-B executed an eight-year contract to purchase 5 megawatts of wind energy for their South Texas facilities. At H-E-B’s Temple Retail Support Center, they installed a 1.4 megawatt rooftop solar panel system which provides over 1.5 million kilowatt hours of renewable energy. The 2.4 megawatt rooftop solar panel system at H-E-B’s San Marcos facility supplies over 3 million kilowatt hours of renewable energy to that facility. In 2016, H-E-B installed rooftop solar panel systems on 18 Austin area stores totaling 4.0 megawatts. Since 2015, H-E-B has installed over 35,000 solar panels on the roofs of their facilities! H-E-B has completed the installation of 4 rooftop solar panel systems at San Antonio stores. They are continuing their work for the remaining rooftop solar panel systems at 26 more area stores. When complete, these systems will provide 15-25% of the energy used by the store. H-E-B continues to invest in energy efficient LED lighting. LED saves energy, produces less heat, and lasts longer than other lighting types. In 2017, H‑E‑B diverted more than 461 million pounds of waste from landfills by recycling cardboard, plastics, organics, office paper, metals, and truck tires. Recycling efforts saved the equivalent of 12 million trees, 1 million barrels of oil, and 690 million kilowatt hours (kWh). That’s enough to power more than 45,000 homes for an entire year! H-E-B’s Organic Diversion Programs have diverted more than 50 million pounds of organics from the landfill to compost and animal feed. By increasing the number of items that go into each bag at checkout, H-E-B has reduced the number of plastic bags they use. Adding just one more item to the bag saves H-E-B 308 million bags per year! In 2017, H-E-B recycled 2 million pounds of plastic bags! In addition, H-EB provides in-store recycling for plastic bags, newspaper sleeves, outer wrap, 6-pack rings, and dry cleaning bags. Each store has specially marked containers for customer deposit. Richard gave examples of sourcing local through H-E-B’s Annual Quest for Texas Best Competition where he shared the story of Hondo Cane Company’s Hondo Sugar Cane Juice. He also spoke about sourcing initiaives abroad, such as chocolate baking items made in Peru sourced from a rain forest where the cocoa is grown and sustainable agriculture is being practiced. Richard closed the session by sharing that H‑E‑B believes that sustainability is meeting the needs of the present without compromising the ability for future generations to meet their own needs. Sustainability and proactive conservation efforts are critical to the environment and for the bottom line as well.